looking for the instructions K-41811. Anyone have them? I checked the K-Line Archive site and it only had a description and a picture. Not sure what instructions you need. One per track at the regular joints, and two identical, one shimmed to half the neighbors height, for each curve. The has been my "go to minimum" for any risers. 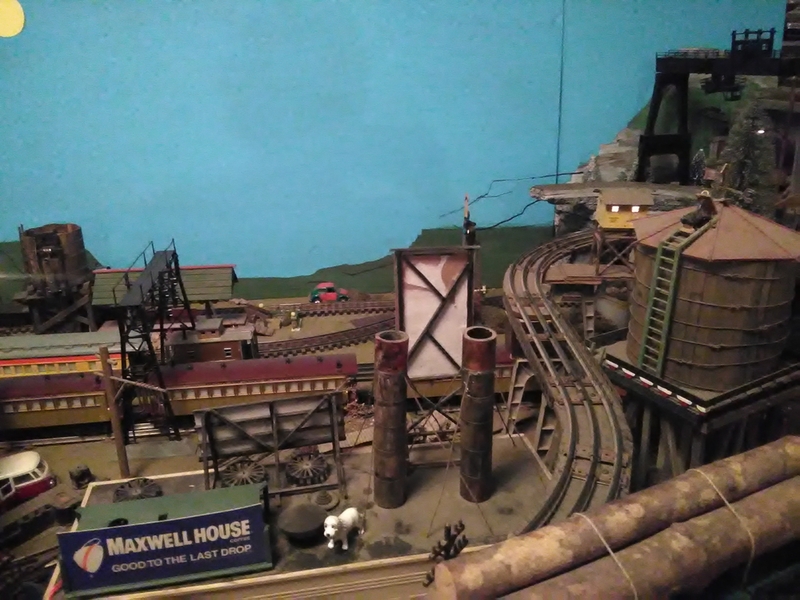 As the grade on them might be too steep for some locos, you should test all your max grade abilities with all locos and load beforehand too, following that lead. I just need to know what the spacing was. 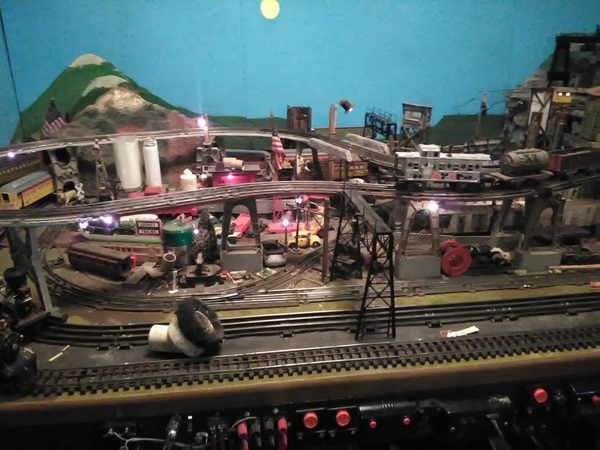 I’m trying to recreate a layout I found on the internet from Allabouttoytrains in FL. I don’t have the track plan, they would not provide it but it seems pretty basic. Why do you need to have two on a curve. I’m not sure there are enough tressels in the K-Line kit to do that. Any idea what the grade is when using the K-Line tressels. I plan to install the Lionel 213 bridge between the tressels in the back of the layout. Two on the curves gives more support to the curved "beam" track section. In the construction world, curved beams must be engineered more robustly. If not, more supports are required. I don't know the measurements of the k-line's height, but thats all we need to calculate a grade ° or % , the units to represent grade. Ideally you want to be at 2.5%, but stock measurements might be 4.5%. 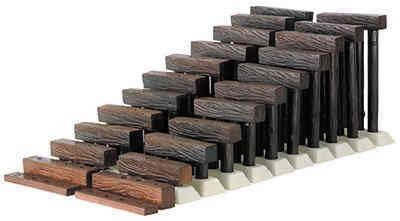 You need more tressels and track to lower it, and you may need more tressels for supporting larger trains. The variables to model RRs are vast. Spacing depends on track type, done so you land them under or very near the joints. Different track means different lengths. If you run support under the rails, Masonite, wood, etc. you can go further without one. So...8-12" average. They don't even have the same twist or joint resistance within brands let alone across them. Train type... a light loco weighs about a pound, others weigh like 8 pounds. I you run only 8 pounders or more, you might want to be closer together than that and have two extra in curves. Do you have a photo, table measurements, track type? Is it simple to describe? That info could help you create a track plan with the help of some software. If you run windows, there are some free trail-softwares online to aid you. Apple and I think you have one or two options, with a cost... and less help here simply because not as many folk use it. Limited to 50 screen items in free ones. These combined with help from folks here can give you a good idea what you'll end up with. I liked Anyrail and loved SCARM. Though the learning curve is a bit steeper, the extra features in scarm are worth it. They contain lots of model scales and brands... but I'd guess scarm would have the k-line if anyone did. (you can still estimate with another brand, but when you use the exact type, it is very accurate.) It's fun once you catch on. Threads for help are abundant. Once you finish building, it's still useful for scenery changes, track changes, etc. Some searching here for old threads will give you a better clue, but either RMT track is a continuation, or very similar to Kline. Vintage Lionel Super O originated the look. The dark rail came from GarGraves. A well know advicate of S.O. track has been offering some good deals on SO loops in the for sale section here. On the other end of the spectrum, Menard's online... their tubular track should be considered. Hefty, & cheap. Scarm's 3d view with zoomable infinite axis (L,R,Up, down) you build in 2d, then take a peek. This is Anyrail overlayed with Photoshop or Word, etc. The track closest to the edge is S.O. 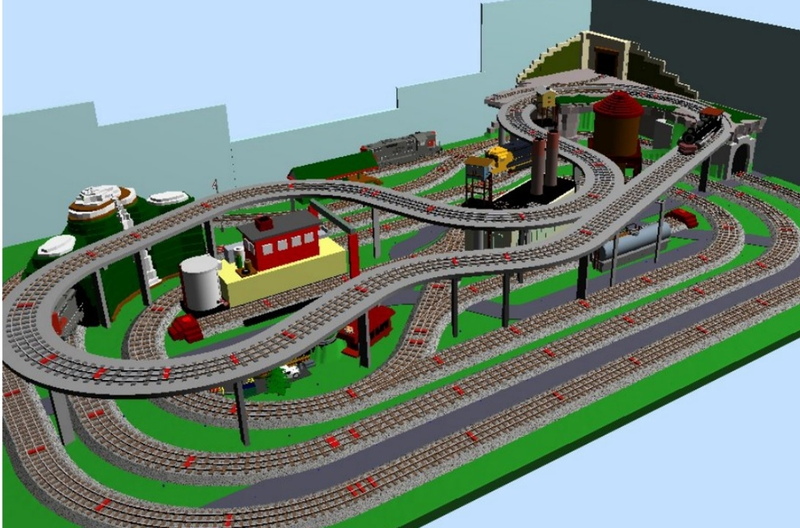 I’m will be using Ross track and have put together a track plan using RR Track software. 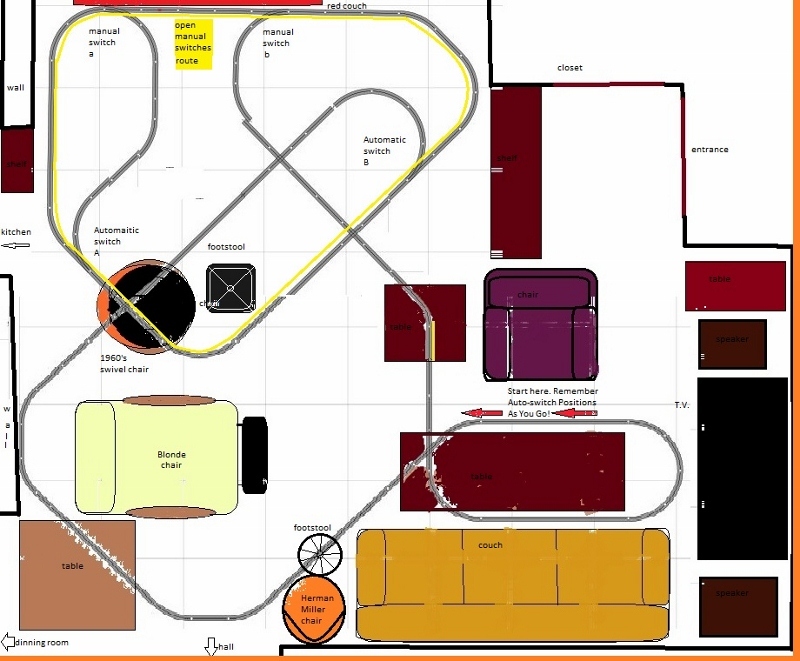 It’s a pretty simple plan 5’6 x 10 foot with two loops 042 and 054 curves similar to the layout shown on the hobby shop web site. I’m not sure at this point if I will use the tressels or not but plan to incorporate my Lione 213 bridge into the plan. I don’t plan to have any switches so I’ll be selling the ones off that I have on my current layout. I’d like to have a staging yard but there is no room because of the size of my buildings. On one end will be a small second level with three Lemax amusement rides. I plan to make use of an idea on the forum to use two bookcases on either end for support with appliance wheels so I can move the layout away from the wall when I want to run trains. Everything will be controlled via the CAB1L and some controllers. I need to take down my current layout and start over again with a smaller design due to spcace limitations.